The Flying Beaver Brothers and the Evil Penguin Plan by Maxwell Eaton III. A Flying Beaver Brothers Book. Review: Beavers that surf, evil penguins and more! The Flying Beaver Brothers and The Evil Penguin Plan (a Flying Beaver Brothers book by Maxwell Eaton III) is a hilarious book that will hook you to the last page. In the beginning of the story, the main characters Ace and Bub are surfing when evil penguins suddenly destroy Ace's surfboard. This result in the beavers following them in a high speed chase. Their rival, Bruce, then tries to stop them from attacking the penguins. Soon Bub finds the penguin's evil lair. Will Bub escape, will they stop the penguins and Bruce, will Ace get his surfboard back? Find out by reading the Flying Beaver Brothers and the Evil Penguin Plan. The Flying Beaver Brothers is a hilarious book. I rate it 9 out of 10 surfboards. The book is a comic book setup with slides and voice bubbles. Ace and Bub are like superheroes trying to thwart an evil plan. 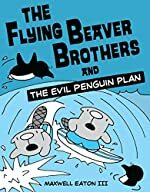 The Flying Beaver Brothers and the Evil Penguin Plan is both funny and happy, but nothing tops the funny parts in the book. This is great for readers in 6th or 7th grade and for people who love comic books or are looking for a new type of book. Everyone should read The Flying Beaver Brothers and the Evil Penguin Plan. The Flying Beaver Brothers and the Evil Penguin Plan is great for car trips, lazy days, going to the beach or even for writing a book review. Also, its great for just reading for fun. We would like to thank Random House for providing a copy of The Flying Beaver Brothers and the Evil Penguin Plan for this review. Have you read The Flying Beaver Brothers and the Evil Penguin Plan? How would you rate it?